India. 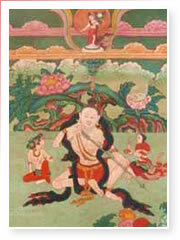 Saraha heads the Mahamudra lineage. And by nothing can we ever be bound." The fool calls green glass emerald." is in and of itself ever liberated. to meander down the crooked way. so don't dally in worldly life. look to yourself - see Innate Mind direct! are fools pursuing the way of death. for the route that is straight!"